Orange is the New Black Season 5 Clip: Does Daya Shoot Humphrey? 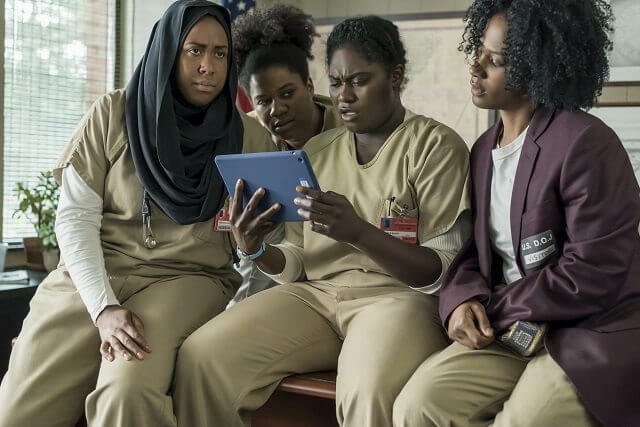 You are at:Home»TV»‘Orange is the New Black’ Season 5 Clip: Does Daya Shoot Humphrey? ‘Orange is the New Black’ Season 5 Clip: Does Daya Shoot Humphrey? The Plot: A riot sparked by Poussey’s death quickly escalates when the inmates gain control of the prison. Once they get a taste of power, chaos erupts in the halls of Litchfield. The unprecedented season will take place in real time and over the course of just three days, leaving the inmates’ lives forever changed as they are emboldened to fight for redemption, resolution and the respect they deserve.